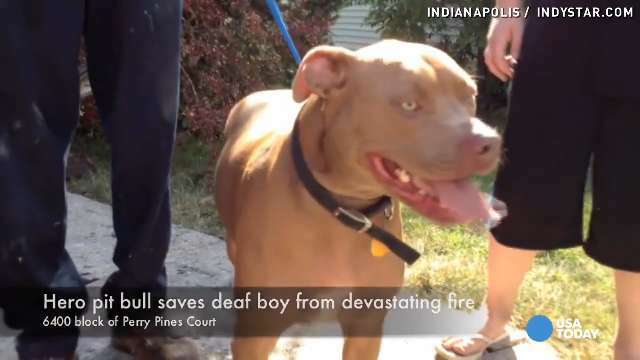 INDIANAPOLIS — A 2-year-old male pit bull named Ace was being hailed as a hero Wednesday, after waking his deaf teenage owner during a devastating house fire. 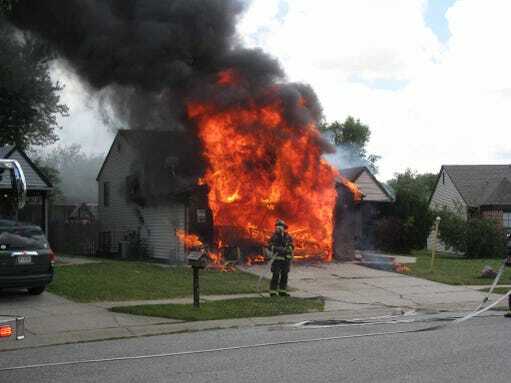 At 1:11 p.m., Indianapolis firefighters were called to fight a fire at a home on the city’s south side, officials said. Upon their arrival, flames were shooting from the garage. Officials said Nick Lamb, 13, who is deaf, was sleeping in the house at the time. Ace was able to alert Nick and awaken him by licking his face. Lamb said he was taught at school about covering his face and finding the nearest exit. Without his shoes but with Ace by his side, he darted out of the back door before calling his mother and 911. The fire-blackened home had $175,000 in damage. But Ace and Lamb made it out safely. No one else was home when the fire started. Lindsay Bernard, Lamb’s mother, says she rushed home from work after getting the call. Her mind was racing throughout the trip. Reith added that the family’s black cat named Pixie was located by a firefighter inside the home and appears to be OK.
Bernard said Pixie inhaled a bit of smoke, and will be spending the night at the vet. The cause of the fire remains under investigation, Reith said. The homeowners believe that it was electrical and originated in the garage.